Keanu Reeves action movie John Wick, reviewed. How Sad Keanu got his groove back. 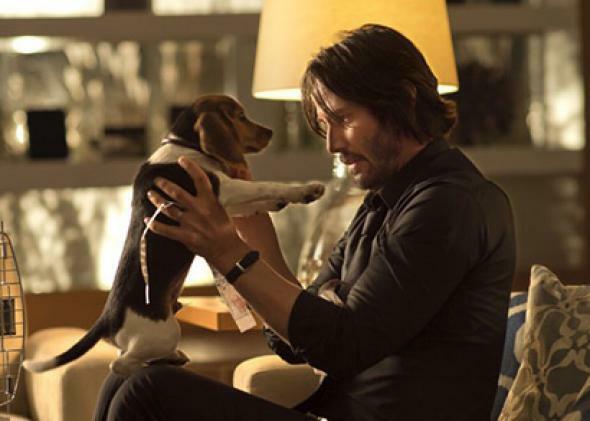 Keanu Reeves and the “world’s cutest puppy” in John Wick. Ever since the end of the Matrix trilogy, there’s been something vaguely morose about Keanu Reeves. The actor has always seemed a little lost—something his best movies have capitalized on—but now there’s an aura of melancholy about him, one that says, “What’s left to do after saving the world?” He’s appeared as an emotionless, despairing alien (The Day the Earth Stood Still), he’s starred in an animated movie about an identity crisis (A Scanner Darkly), and he’s even tried self-parody (Thumbsucker). When he tried saving the world again (Constantine), it just wasn’t the same. After all this, his most iconic role from the past decade remains the one in which he appeared hangdog, on a park bench, eating a sandwich: I’m writing, of course, of Sad Keanu. But Keanu fans should take heart, because the stylish new shoot ’em up John Wick begins where that meme left off—Keanu’s title character is sad and on the street and can’t even find a park bench to slouch on—but eventually brings both the actor and his character to where we can believe in them again. It’s How Sad Keanu Got His Groove Back. We begin with our hero remembering his better days, and a long way from finding meaning again. As at the beginning of every good hit man picture, he has gotten out of the game, and as at the beginning of many good “you messed with the wrong man” pictures, his wife is dead. (As we gather from the mostly wordless opening, she died of a sudden illness.) There’s no reason for him to go on, until he receives an unexpected delivery: what my notes describe only as “world’s cutest puppy.” Before her death, Wick’s wife quietly arranged to have the beagle delivered after her passing, to give the bereaved some hope. It’s a slow process, and we’re treated to several tableaux: Sad Keanu with beagle, allowing her to jump up on the bed. Sad Keanu with beagle, eating cornflakes. (Quoth Keanu to the puppy: “We’ll grab you some kibble later.”) Sad Keanu with his ’69 Mustang in an airfield, doing some very mournful doughnuts. Needless to say, this is one soulful grieving hit man, and his well of pent-up emotions is finally tapped when the spoiled son of a Russian mob boss comes lusting for the Mustang—and attacks the puppy. (I’ll save dog-lovers a trip to another website: The dog dies.) From this point, the movie becomes essentially a revenge picture in which Wick kills dozens of Russki thugs because they messed with the wrong pooch. You know what kind of movie you’re dealing with once you get to the scene in which the mob boss (Michael Nyqvist) calls in his son to explain just how badly he’s blown it this time. (Nyqvist, best known for the Swedish Dragon Tattoo movies, is one of several great character actors in the movie: Willem Dafoe, John Leguizamo, and Ian McShane also make the most of brief appearances.) The kingpin’s description of the hit man Wick once was has the self-consciously over-the-top tone of a Chuck Norris joke, or an ad for Dos Equis: “He wasn’t exactly the boogeyman,” the kingpin explains. “He was the guy you called to kill the boogeyman.” “I once saw him kill three men with a pencil,” he continues. Wick may be skilled with a pencil, but he dispatches most of the movie’s many anonymous goons the old-fashioned way: by pumping them full of lead. More specifically, he specializes in gun fu, the style of close-quarters gunplay popularized by Hong Kong action flicks and furthered in domestic movies like Equilibrium. Above all, his almost supernatural skills evoke those of The Matrix’s Neo, which—combined with his all-black outfits—seems not unintentional. This is not an action movie in the Michael Bay lineage; rather than an escalating series of explosions, John Wick offers a slow burn, sizzling in a manner true to its hero’s surname. Some of its self-assured cool comes courtesy of the influence of Jean-Pierre Melville, who pioneered the subgenre of the existential hit man movie with Le Samouraï, and whose Le Cercle Rouge receives an homage in Wick in the form of a nightclub called the Red Circle. As in Le Samouraï, the criminals here “live by a certain code,” forming an underground where everything from a call for dry cleaning to a dinner reservation is actually a veiled request for something far more nefarious. (One wonders how they order when they actually need their shirts pressed.) The movie’s awareness of its own movieness is underlined by lots of shallow focus and anamorphic lens flares, and one extended shootout at a neon-lit nightclub—the movie’s high point—seems straight out of Collateral. Even the subtitles draw attention to themselves, popping select words in italics and bright color, in a manner reminiscent of the dialogue in pulpy crime comics. (“You stole my car,” Wick reminds them in Russian, “and you killed my dog.”) The movie seems to acknowledge its debt to another pop influence, video games, by intercutting one of its action scenes with shots of a first-person shooter. That sequence is just one way the movie demonstrates that it knows exactly how smart and how dumb it really is. The laconic screenplay stays away from high-minded dialogue. (The two lines that got the biggest laughs at my showing were both “Oh.”) Instead, it relies on visual storytelling, as when the killing of Wick’s dog is crosscut with flashbacks to the death of his wife, to show us Wick sees these events essentially the same way: as evidence of an unjust world. Wick learns by the end that the real world doesn’t adhere to any code, but that doesn’t mean he can’t seek out hope for himself. With Wick—the best Reeves role in years, and the best existential actioner since Drive—Reeves fans have found something that should cheer them up, too.